Bailey has had a long long road, but she is finally safe in a good home! 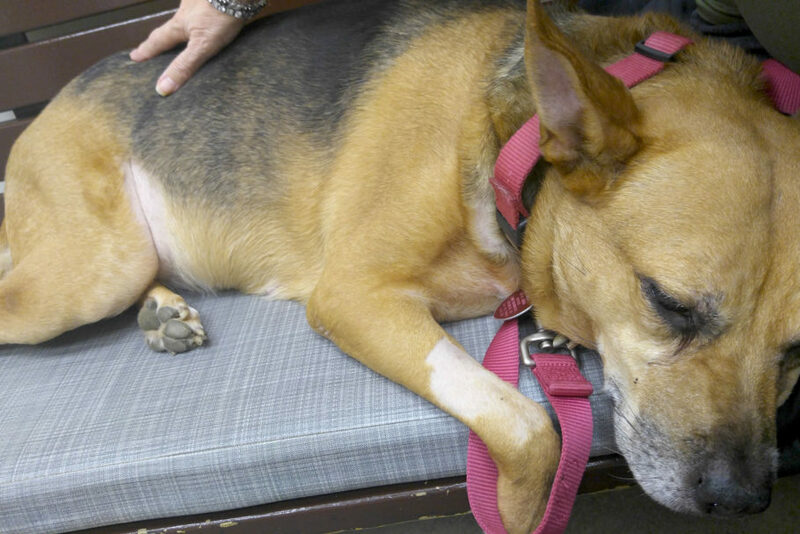 Now they all need our help with Bailey's medical bills and heart condition! What a Dog! What an Owner! What a Story! Kathy lives in New Jersey, and rescued Bailey through a group way back in 2015. That rescue ended up having Bailey go to a farm in Louisiana. Everything had been checked out with references etc, and it seemed like Bailey, who had been a suffering an abused dog, was going to go live a happy life! A woman had found Bailey running loose in a small Louisiana town. The woman had attempted to contact the listing on Bailey’s collar, but had not managed to reach anyone, but then she noticed the rabies ID number, and had tracked it down to Kathy in New Jersey! She even managed to get Kathy’s phone number! So imagine Kathy’s surprise when she gets a phone call from Louisiana and the woman on the line says “I have your dog”! Kathy actually said back, “My dog is right here with me!” but shortly she came to figure it out… Bailey had somehow gotten out of her farm-foster and had been found stray. Kathy looked into it, and the more she looked the more upset she got. She didn’t like the situation, and started to question the foster, and to get to the point: Kathy went down to Louisiana to get Bailey herself and bring her to live in New Jersey. It was an expensive endeavor but Kathy even managed to get Delta Airlines to pay for her ticket, and Subaru donated a rental car to her! So just when Bailey looked to have finally caught her break, she starts acting quite sick, with especially labored breathing. Her heart-worm test comes back positive. So then a hearth-worm treatment plan is set up. This involves a series of injections that kill the worms over time, but can have complications. Well, Bailey has complications! Shortly after her first injection she appears to go in cardiac arrest…. struggling with breathing, Kathy rushed her to the ER and Bailey was put in an oxygen tank. Turns out it was not the heart-worm medication though, but rather a bad heart valve. The good news is the medications for Bailey are very effective and should help her a lot! They cost about $150.00 a month though. And of course, Kathy has spent so much on Bailey’s care up to this point! Kathy is raising money for 6 months of Bailey’s medications as well as to help cover the past bills, and the heart-worm treatment. All donations are only for Bailey! The donations are held by us and will only be paid to the respective veterinarians. No money will be paid to Kathy. It all goes only for Bailey and to Bailey’s vet so you can donate in confidence! WOOOF!!! Thank you for loving Bailey! You have already done more than most would or could do. Prayers for Bailey. Sweet Bailey girl I’m praying for you. It’s not as much as I would like, but I hope it helps sweet Bailey. It’s not as much a…s I would like, but I hope it helps sweet Bailey. Sweet Bailey girl I'…m praying for you. Thank you for loving… Bailey! Bailey has lost some weight and seems to sleep and rest a lot of the time. Her heart rate is rapid and the medications have kept the fluid off of her lungs. Bailey is on very restricted activity and is not allowed to climb the stairs. It's difficult because she loves coming upstairs with me to lay on the bed. She in continually monitored by the cardiologist almost weekly to make sure she is not falling back into the critical stages where she would need to be hospitalized.